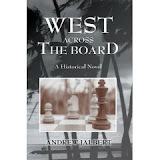 Andrew Jalbert’s novel, West Across the Board, chronicles one man’s journey back to the Florida Keys to see his dying friend. For both men, it is a journey of lifetime reflection and liberation. In 1934, at a saloon in the Florida Keys, Lazaro, a passionate and brilliant fisherman, meets Dominic, a civil engineer graduate. The two young men instantly bond over a game of chess. The game would become more than recreation. It would become the cement that binds the two through a lifetime of love, loss, forgiveness, and redemption. With such themes as the beauty and danger of nature entwining itself with the strength and frailties of human nature, a story of growth and survival unfolds. Drawing on Physicists research into the Chaos Theory, Dominic, a pragmatist, tries to find order from tragic events that affected the choices both he and Lazaro made. Lazaro, a man forever changed from the loss of his father during a storm at sea, reflects on his life in a more traditional sense. Dominic tries to find a logical pattern of events, while Lazaro buries his need to resolve issues that led to his choice to leave the Florida Keys for a life in Wisconsin. It is only when the two men come together that Lazaro is able to confront his past. As historical fiction, the author delivers a carefully crafted and detailed account of life on the Florida Keys. The story is rich in the sights, sounds, and description of life in the 1930’s. Drawing on real events from the past, the fictional story is well implemented within its historical context. The historical and nautical details illustrated within the story are well researched and accurately presented. West Across the Board delivers a well crafted tale of two men’s journey back together to find redemption and peace. The history and backdrop of the Florida Keys makes readers feel they are accompanying Lazaro on his journey. I highly recommend the book to readers who enjoy well written historical fiction that delves into the human condition.